With this easy weeknight meal you get all the flavor and satisfaction that comes with a traditional pasta dish, without all the guilt. 1. Cut the squash in half lengthwise and scoop out the seeds. Put the squash cut-side down in a microwave-safe dish with 1 cup water. Microwave until tender, about 12-15 minutes. 2. Let cool slightly and use a fork to scrape out the flesh in strands. Set aside. 3. Meanwhile, heat the olive oil in a large skillet over medium heat and add garlic. Cook till translucent and aromatic about 3-5 minutes. 4. Add the wine; bring to a boil and cook until reduced by half. 5. Add shrimp, lemon juice and lemon zest. Cook till shrimp is opaque and starts to turn pink. 6. 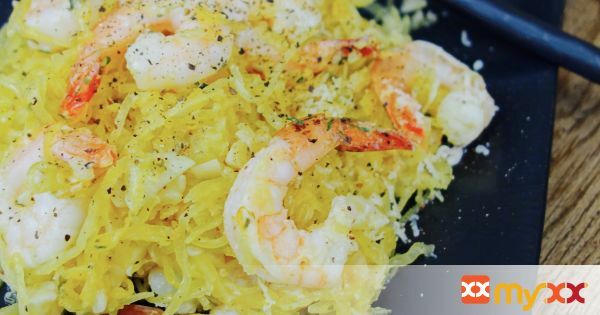 Toss in spaghetti squash, drizzle olive oil and add half of the parmesan cheese. Continue to cook until the spaghetti squash has absorbed most of the liquid. 7. Add chopped parsley, remaining parmesan cheese and season with salt and pepper to taste. Enjoy!